As I've been preparing to serve this summer, I thought there wasn't anything else to know than what I've experienced overseas already. I thought, "culture shock didn't happen to me, I knew what to expect." But sitting through the session about it, I realized that I actually had experienced it, I just didn't know how to label it at the time. This is pretty much how my entire weekend went--with me walking into a session thinking I knew exactly what to expect, and leaving humbled, yet encouraged, with new knowledge. This past weekend, May 17-19, 198 of the 298 student summer missionaries gathered at Dallas Baptist University for the final step in preparations before heading out into different parts of the nation and world this summer. They are part of the 466 Go Now Missionaries that will serve in 2014. "It would be easy to say 'they are just college students,' but through the years I have seen God use committed student missionaries in amazing ways," Brenda Sanders, director of Go Now Missions, said. "We have trained them to share the Gospel. We have commissioned them as his servants. We are sending them out as His ambassadors." Everyone was placed in separate "tribes" according to their teams for each trip and given tasks to delegate and complete over the course of the weekend. 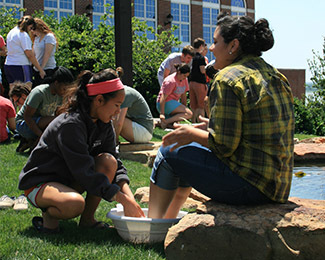 Through fun activities like making a dream island out of play dough, to the surprising task of taking a bucket bath, students were challenged to be flexible and ready for the unexpected, and most importantly, to seek God through it all. Lindzey Gill, from West Texas A&M University and serving in Texas and New York, said, "I was just reminded of how important it is to be sustained by God. I definitely won't be able to do anything this summer out of my own strength." The Go Now staff presented many sessions in this packed-full weekend. No time was wasted as each activity and meal had the purpose of bringing up scenarios that may be encountered on the field of service. The sessions ranged from everyday things like keeping a ledger, to deeper things like being intentional daily, prayer-walking, and ministering to Muslims or Hindus. We were tested on our required scripture memory, but also prompted to provide scripture references from prior knowledge for different situations. Caleb Gestes, a student from the University of Texas at Austin who will serve in Russia, found the session on preparing to go spiritually most important. "As a first time Go Now missionary, what scared me most was my possible inadequacy," he said. "How can I, an imperfect person, possibly represent a perfect God? In our study of John 15:1-17, he reminded me I am simply a vessel who God is going through. This is a comforting thought!" 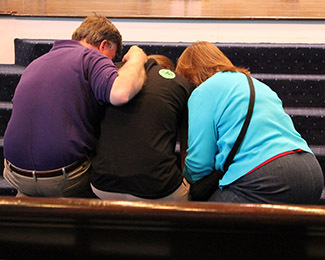 On Sunday, all the student missionaries were commissioned. "The commissioning service was amazing," said Alli Bradburn, a student from the University of Mary Hardin-Baylor who will be serving in Central Asia for the summer. "Getting to see everyone come together to pray about being sent out was really neat, especially with family and friends there for support." I am amazed at how wonderful this weekend was, and at how much more prepared I feel for serving this summer. Thanks to the wonderful Go Now staff for providing us with such great information, encouragement, and reminding us of Jeremiah 17:7-8. "Orientation this year went exceedingly well. Our students were given opportunities to become more attentive to God's calling in their lives, the life of their teams, and the lives of the people they are being sent to serve," said Clayton Bullion, sending team chairperson and BSM director at Tarleton University. "They are a great group of students and I'm excited to hear what God will do through them among the nations, the U.S. and right here in Texas." Some teams have already departed for their field of service, and the rest of us will trickle out within the next couple months. Please be in prayer for everyone as we serve as close as in-state to as far as halfway around the world. This story was written by Audrey Aguayo, a student from West Texas A&M University, who will be serving as a Go Now missionary in Central Europe this summer.